I recently read that “New Orleans is a city where you can smoke inside and drink outside.” That’s a fun quote that makes one laugh BUT it’s not entirely true anymore. Today, we’re going to focus on giving you as many useful tips as possible for your visit to the Big Easy. WHAT’S THE DEAL WITH GO CUPS? Out-of-town folks are stunned (like my husband and myself) when they experience the go cup for the first time. We were in a bar in a hotel and when we got up to leave the female bartender raced over and said, “You still have drinks here – you must take them with you.” She explained the unique “go cup” tradition of New Orleans as she poured our drinks into two red plastic cups. Remember: carrying glass bottles is not permitted simply because of the dangers they pose when they break. Go cups are given when you don’t finish your drink or you can simply order a drink “to go.” You can also go up to a sidewalk window and order a drink in a plastic cup. 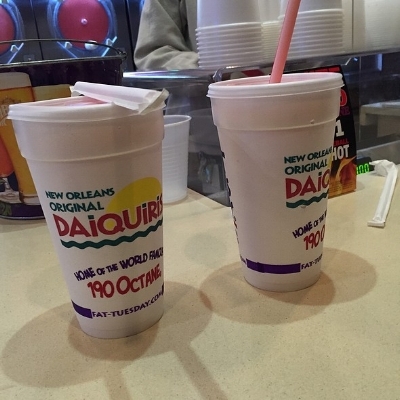 Then there’s the Daiquiri Drive-thru where you can order a frozen version of this classic drink AND, as long as the lid isn’t punctured and the straw isn’t inserted, you can legally drive with it. There is NO official CLOSING TIME in New Orleans for bars, pubs and saloons. This means that many are open 24 hours a day, 12 months a year. CAN YOU SMOKE IN NOLA’S RESTAURANTS AND BARS? There seems to be a “no smoking” rule everywhere these days. And, in April 2015 it finally hit New Orleans. So here’s where we are now: bar owners and patrons say they’re seeing this scene: a lively crowd outside and a near-empty barroom inside. You can still smoke on a patio or balcony and in a courtyard SO owners are squeezing more chairs into courtyards, adding tables to sidewalks, installing awnings to protect smoking patrons from the rain AND get this: allowing patrons to place signs at the bar to reserve their seats for 10 minutes while they go outside and smoke. There is no end to American ingenuity! HOW DO I GET A CAB OR CONTACT UBER? New Orleans is like New York: it’s a great walking town. However, in NOLA taxicabs are not controlled by a central dispatch and they are hard to flag down. So you have to pick up your phone and call. You can also reserve online or with an app. The largest and oldest taxicab company in New Orleans is United Cabs at (504) 522-9771 or (504) 524-9606 (great for getting to and from the airport). What about Uber? If you use the app on your phone in your home city, it will work the same in New Orleans. Uber is a good idea if you decide to go to the famous Mid-City Rock ‘n’ Bowl. WHERE CAN I FIND A WIDE SELECTION OF SOUVENIRS?